This 11th episode of "The Life and Times of $crooge McDuck" happens during a looong period of Scrooge's life (1909 to 1930), so there are a looot of references to Barksian stories, and a looot of redrawn panels, of course! So we have a biiig feeling of déjà-vu!!! Then, that one, from "Hoodoo Voodoo" too. This is not Donald Duck but Scrooge ! In "Voodoo Hoodoo", Scrooge tells Donald that he looked like him when he was young, and we see this panel. It is supposed that he didn't have whiskers in 1909. 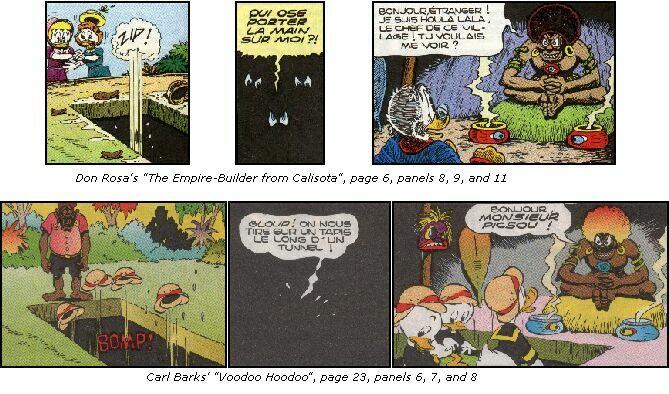 A panel from "The Mines of King Solomon" is used too in the drawing "Les Inédits de Don Rosa" #25. Panels from "Only a Poor Old Man" are used in "Cash Flow" (AR 106), "Last Sled to Dawson" (AR 113), "The King Of The Copper Hill" (D 92083), "The Billionaire Of Dismal Downs" (D 93121), and "The Richest Duck in the World" (D 93488). 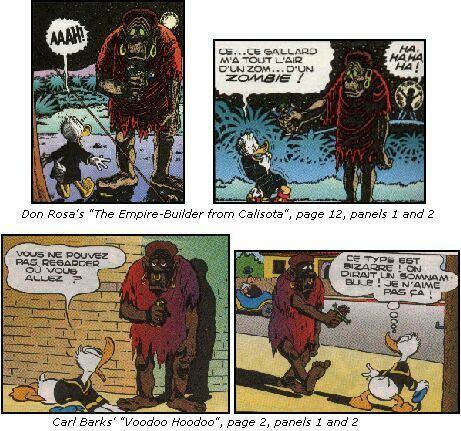 Another story uses panels from "Voodoo Hoodoo" : "Give Unto Others" (H 87178), and so does the drawing "Scrooge's First Appearances".